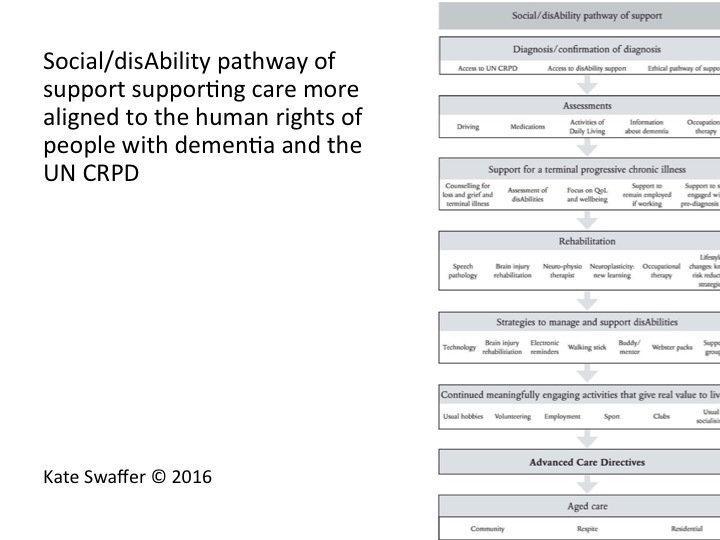 The following are the two pathways of support published in my book, (Swaffer, K 2016, What the hell happened to my brain? : Living beyond dementia, Jessica Kingsley Publishers, p.p. 165-166) that many have recently asked me for. So, in case you simply wish to refer to them, I am adding them from a set of power point slides that I used recently! Swaffer, K 2016, What the hell happened to my brain? : Living beyond dementia, Jessica Kingsley Publishers, p165. Swaffer, K 2016, What the hell happened to my brain? : Living beyond dementia, Jessica Kingsley Publishers, p166. March 28, 2016 in Dementia, disAbility Rights, Human Rights, Prescribed Disengagement ®. 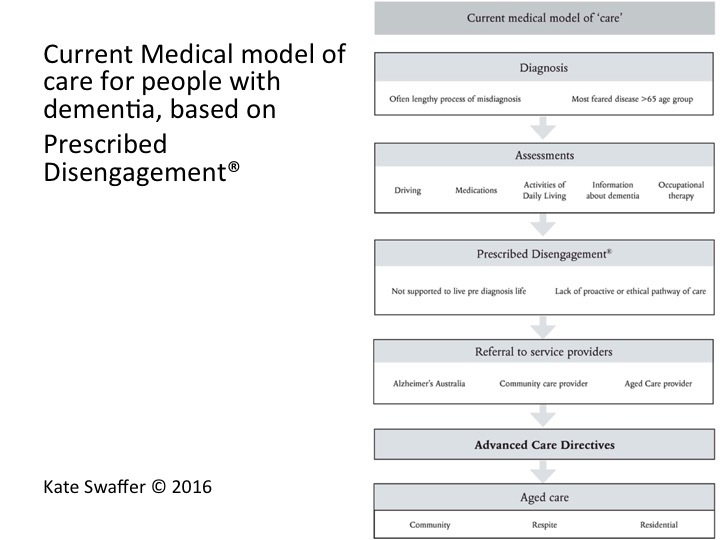 Kate Swaffer describes the current pathway…medical model…fir people with dementia, as against the social model which many of us look for. There’s just do little support post diagnosis to live well. Thanks Kate. I’m not able to read the slides easily, even when I zoom in on them. Is there a way to make theme more readable and thus shareable? I would love to share this post on the newly (yesterday!) launched People for Person-Centered Dementia Care Facebook page and LinkedIn Group, which I’ve invited you to join. But I want to people to be able to easily read the information. Thanks Kate – it appears to be great information, but I’m unable to see it clearly despite zooming in etc. Appreciate this! But its very hard to read in the current format….